We weathered a tornado last week. Our farm was spared any damage, all the animals are fine and only a few pieces of metal off the back porch roof came loose. Power was out for a couple of days, but compared to what the people down the hill endured. It was complete devastation. And then we remember the total destruction of homes in Tuscaloosa and this is nothing by comparison. I have family in those areas. They are all well and in one piece. That was the big news in this little piece of heaven. We have planned on this for years and I do mean years…. goats. The same day C-Man came home with Cooper he brought home three goats. One is the mama goat and the others are kids. 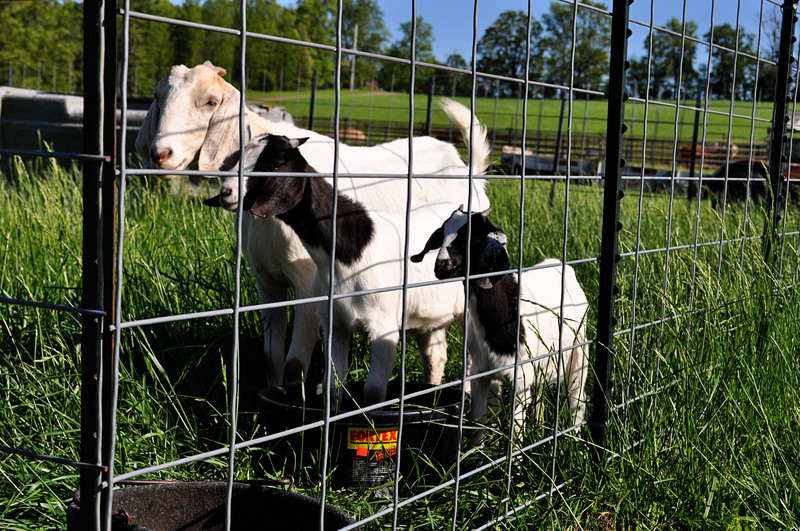 These goats are Nubian milk goats. They are exactly what we have been looking for. 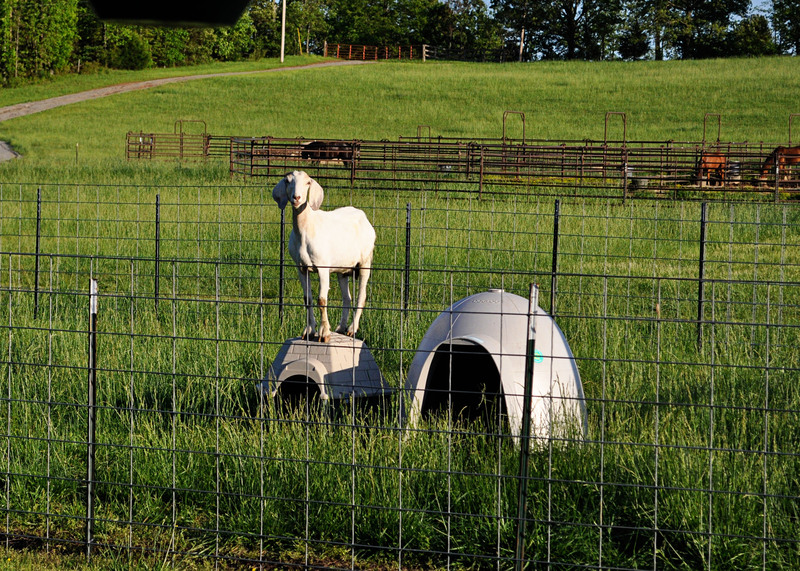 I am unfamiliar with goat behavior. They are funny creatures to me. The big one is Maddy, the mama. The middle one is Estelle and the tiny one is Mitzi. Aren’t they kidda cute? These are Nubian goats. They are milk goats. That means, I will be milking her when she kids next spring. I have aspirations of cheese making. 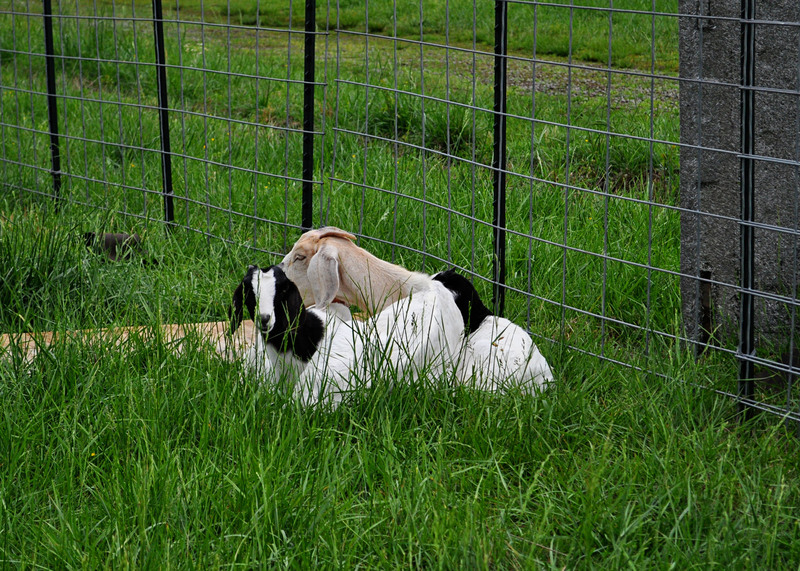 These silly girls live in a pen full of grass, but they find it greener on the other side. 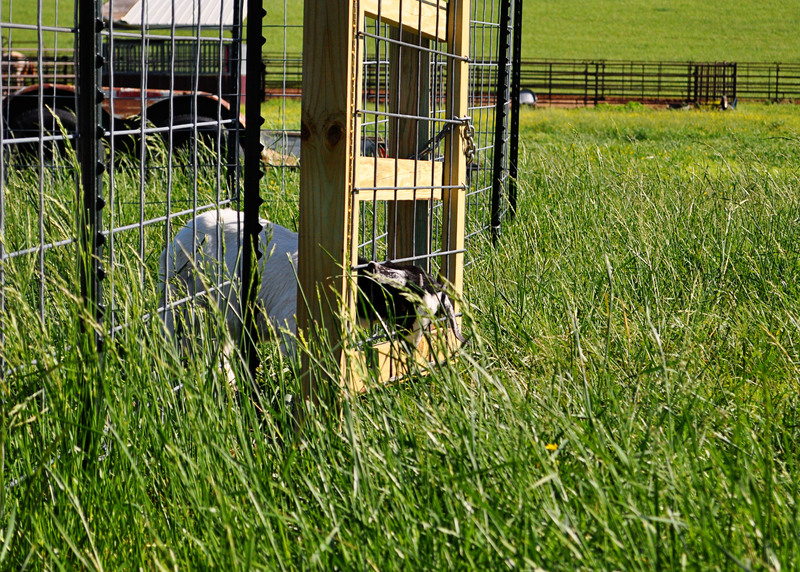 For some reason poking your head through the fence to eat is more fun than just grazing inside the fence. They also have to have protection from the rain. 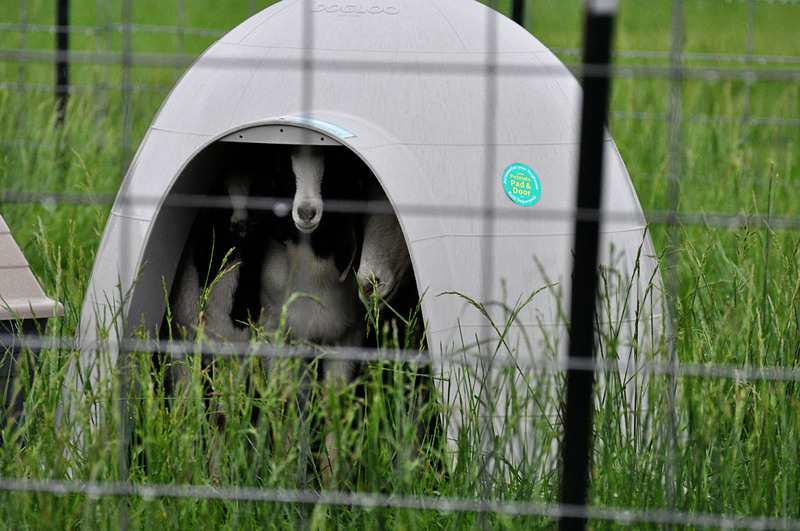 The tornado blew away the original shelter so we ran out and bought a dog igloo for these girls. All three of them are crammed in it to get out of the rain. 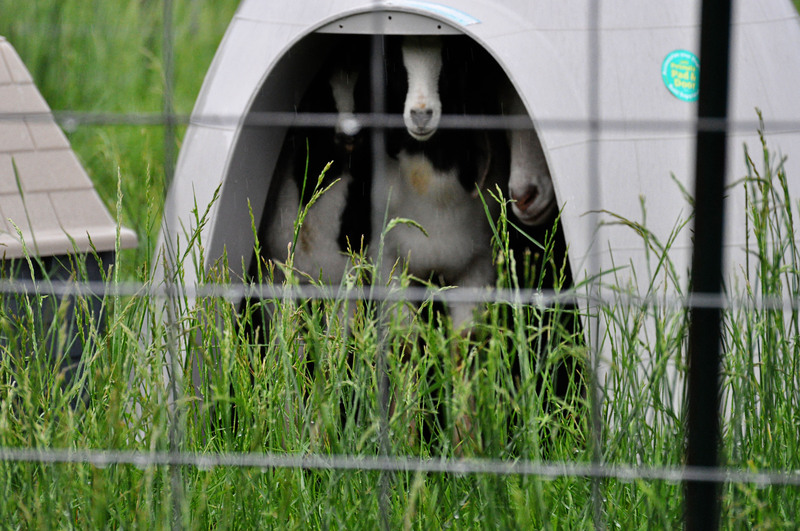 Goats don’t like to stand in the weather. I like to see them all piled on each other too. And…. 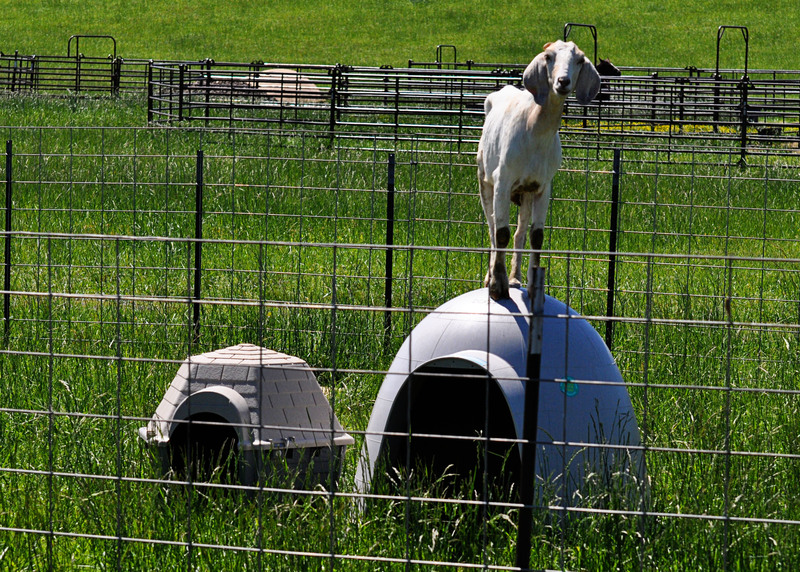 the most characteristic trait of goats is their love of climbing. The girl who can stand highest is the best. She can really stand on a round dome, and she loves it. She is the queen of the heap. Now all I have to do is get this nanny accustomed to me handling her and her udder. Easily accomplished with tidbits of grain. I really love this little piece of heaven. These pics are wonderful. I’ve never thought goats were cute, but I’ve just changed my mind. The next thing we will see is a baby stroller with the new “baby” being pushed everywhere. He is adorable Jeannene.